The Bean has a new word, it is house. She loves to say it and finds houses every where. Inspired by her new word I made the girls some house magnets with the leftover shrinky dinks from our sun catcher. The idea for the houses actually came from one of our current favorite books This is The House That Jack Built by Simms Tabback. The book is a beautifully illustrated rendition of the classic children's rhyme and a fun one to read aloud to kids. The front and back pages of the book are filled with illustrations of all different kinds of houses. The thing I love most about the illustrations is how simple they are, the houses are all made using basic shapes like squares and rectangles. 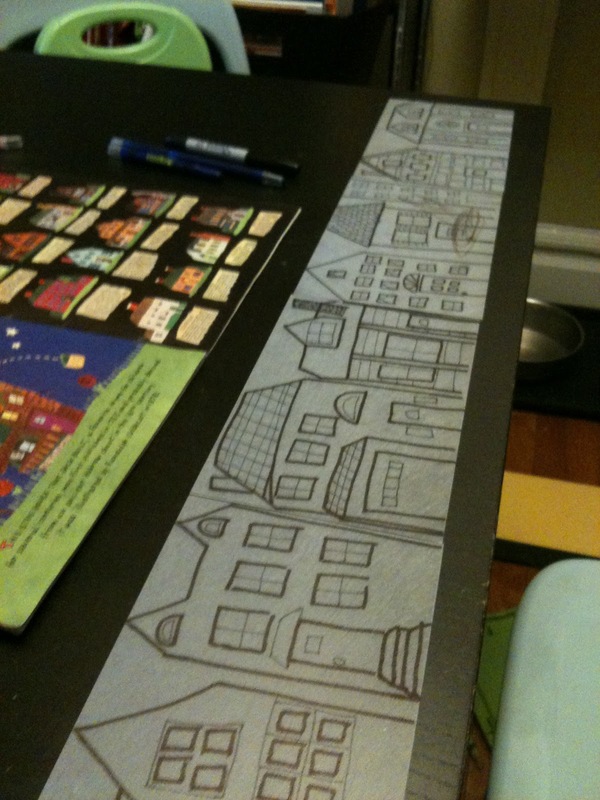 Using the illustrations as my inspiration I begin drawing houses with black sharpie marker right onto the shrinky dink plastic papers. Drawing the houses was fun, since I was just using simple shapes they were very easy to draw and I had a blast adding little details to each house. 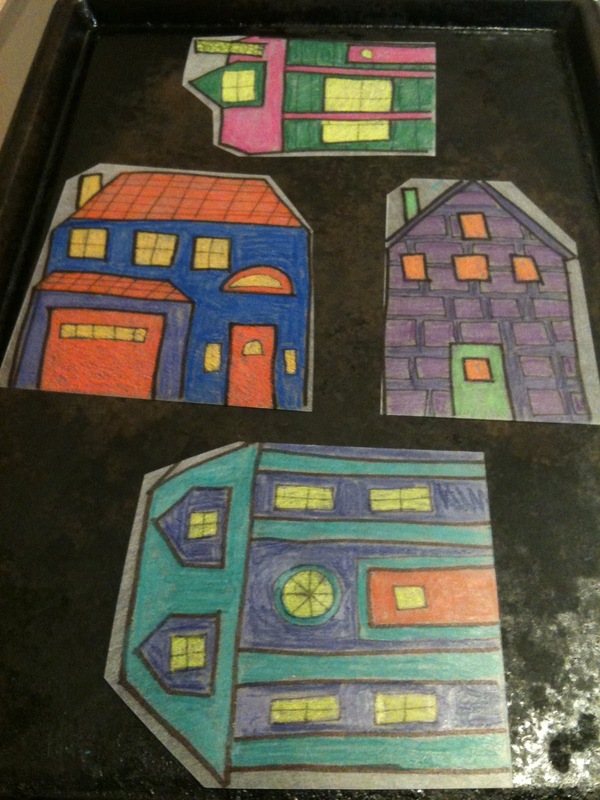 Once I was finished drawing the houses I colored them with crayons, cut them and placed them on a baking sheet. I then put them in a 350 degree oven for just a few minutes. The one thing you do want to watch in that the shrinky dinks don't curl and stick to each other. If they do start to curl and stick just pull them apart quickly while they are still hot and stick them back into the oven, the heat will flatten them back out. The shrinky dinks only take a few moments to shrink and cool very quickly. Once they had cooled I cut small pieces of magnet tape for the back of each house and stuck them on the fridge. Both the Bee and The Bean have loved aranging the houses and now the Bean gets to practice her new word every time she comes into the kitchen! I love this! We are so into shrinky dinks at our house, it's the theme of my 7yr old's b-day party! I love the houses and I'll be doing our own fridge neighborhood soon.